Whether you have decided to use a Native American dog name because your pup has wolf-like qualities, or you have a Native American heritage, or you simply want to give your dog the best and most unique name, you are lucky because you can choose from a wide variety of beautiful names suitable for female and male dogs, for big and small ones, and for just about any breed and type of dog. It is good to know that Native American names are considered as lucky and will present the dog or another name bearer with longevity and good health because these names are sacred according to the Native Americans. This means, that not only your dog will have a one-of-a-kind name, but you will gift it with a lucky charm and hopeful it will live a happy and healthy long life with you too. It is also worth noting, that according to Native American Folklore believes that the people who love and treat dogs well will get rewarded, and those who dislike and mistreat them will be punished by fate. The reason for this love of canines is the fact that dogs have played a huge role in the lives and history of the Native Americans, who have used them for camp guarding, hunting, herding, retrieving, sled hauling and as clan animals. There are some dog breeds which still have Native American genetics such as the Alaskan malamute, the Mackenzie River Husky, the Labrador Husky and the Xoloitzcuintli. But the truth is you can give a suitable and wonderful Native American name to any type of dog from any breed or one without a breed. The beauty and the significance of Native American names are due to the fact that the name protects, heals and helps the person or animal throughout their life. 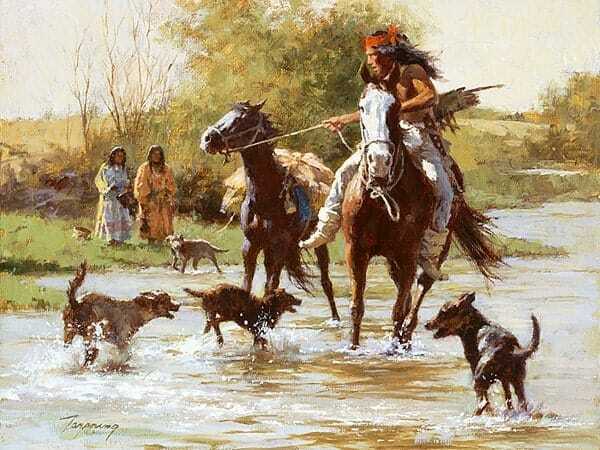 So, let’s look at the various categories and types of Native American dog names which you can choose from. Geronimo = The famous Apache Leader whose name means “the one who yawns”. Pontiac = A war chief from the Pontiac war against the British military occupation in the Great Lakes region. Dog Names inspired by the Native American culture. We have tried to add just about any suitable Native American based dog name in this long list, so hopefully, you will be able to find the one which describes your dog the best. You can be pretty sure that your four-legged friend will have a name like no other when you go out to the doggy park, and you will ensure that it is blessed with a name which according to the folklore of the Native Americans will bring longevity, strength, and health to it as well. So, take your time, and make sure you pick the best Native American name for your pet, which both you and your fur baby will love!